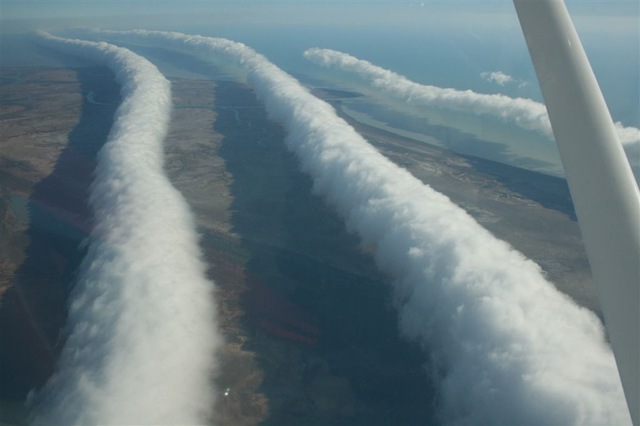 The Morning Glory cloud is a rare meteorological phenomenon observed in Northern Australia’s Gulf of Carpentaria. A Morning Glory cloud is a roll cloud that can be up to 1000 kilometers long, 1 to 2 kilometers high, and can move at speeds up to 60 kilometers per hour despite there being little wind. Apparently people do not really know what causes them (nice to still allow for a sense of mystery in creation instead of killing it with scientific explanations). Why do Morning Glory Clouds exist? Easy …. for the glory of God as they proclaim his handiwork! And in that sense the purpose of our existence is not dissimilar! When by God’s providence suffering enters into someone’s life, the divine purpose of that suffering may be compared to the effect of boiling eggs and potatoes in water – one may be hardened while the other is softened. In Revelation 21:1 and 2 Peter 3:10 we are told that the present earth and heavens will “pass away”. Does this mean that they will cease to exist? Not entirely. The old creation will give way to the new creation in such a way as there will be a radical transformation of what now exists. This earth will pass away as a new creation emerges. The caterpillar will pass away and the butterfly will emerge. The tadpole will pass away and the the frog appear. Never forget that when we are dealing with any pleasure in its healthy and satisfying form, we are, in a sense, on the Enemy’s ground. I know we have won many a soul through pleasure. All the same, it is His invention, not ours. He made the pleasures: all our research so far has not enabled us to produce one. All we can do is encourage the humans to take the pleasures which our Enemy has produced, at times, or in ways, or in degrees, which he has forbidden…. An ever increasing craving for an ever diminishing pleasure is the formula…. To get a man’s soul and give him nothing in return—that’s what really gladdens Our Father’s heart.